Editor’s Note: This piece first appeared as part of New York Times’ "Room for Debate." Enough Project Co-founder John Prendergast and others—including writer Eve Ensler, consultant and analyst Willet Weeks, Kambale Musavuli of Friends of the Congo, Yaa-Lengi Ngemi of the Congo Coalition, and Séverine Autesserre of Columbia University—address the complex question: How to stabilize Congo? There will be no peace in Congo as long as ruthless interests can make immense profits from the extraction of minerals and other resources, with the connivance of regional governments. Corrupt Congolese officials have no interest in justice or army reform because they reap windfalls from mafia-like smuggling and land grabbing. It will take an effort to change market incentives similar to the one that ended the blood diamonds wars elsewhere in Africa. Rwanda’s post-genocide economic miracle has benefited from huge exports of smuggled Congolese tin and tantalum. Influential Ugandans enrich themselves through major illicit Congolese gold exports. This ensures that eastern Congo remains at the mercy of armed groups and their criminal business partners allied with Kinshasa, Kigali or Kampala. As with all mafias, sometimes these competing groups fight, sometimes they cooperate. After rules in the Dodd-Frank legislation required companies to disclose whether they used minerals from conflict-torn areas, war profits went down and reforms emerged in the region. But the vested interests in the rotting status quo remain strong, and so the war continues. A highly experienced United Nations envoy—similar in stature to Lakhdar Brahimi in Syria, for example—needs to be assigned to the Congo by the secretary-general to help broaden and strengthen the peace process. That envoy could work with the African Union in constructing a process that involves civil society and political parties from eastern Congo to deal with the war’s root economic causes. Interstate infrastructure projects, shared cross-border mineral processing initiatives, and joint investment opportunities in certified mineral production could help remove the region’s winner-take-all philosophy. Appointing a senior U.S. presidential envoy could create more leverage for peace. Additionally, stepping up U.N. sanctions and International Criminal Court cases against parties responsible for orchestrating or financing war crimes would finally help break the cycle of deadly impunity. Read the opinions of other “Room for Debate” contributors on how to stabilize Congo. 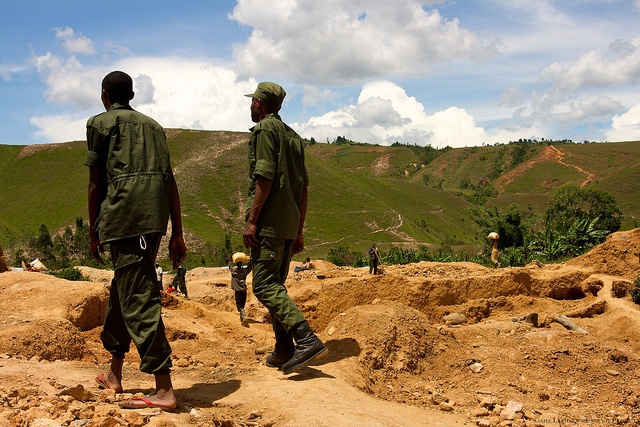 Photo: Gold mine in South Kivu, Congo (Sasha Lezhnev/Enough Project).